Hi Shi’an, I just wanted to say thank you for the lessons over the last 10 weeks. I have learnt so much from you about Pure Land. I am glad I took the plunge and attended this course. Your rock solid, unwavering faith continues to inspire me and makes me vow even more to be reborn in Pure Land. I especially enjoyed the sutra lesson today. Your lessons are always interesting and inspirational, never with a dull moment. You teach with humour, examples and analogies that are current which makes it easy to relate to everyday life. I appreciate all the effort you have put into the course preparation. After having done this 12 times before, I imagine that one with less faith and conviction could feel bored or worse, complacent teaching similar materials over the years. In this case, I feel that as you grew spiritually over the years. Your faith has strengthened continually and your passion to teach the Dharma is incredible! You are truly a wonderful, motivational and inspirational teacher. Lastly, in a nutshell, you have taught me more in the last 10 weeks than “where I used to go to weekly” in the last 40+ years. Therefore, I thank you and I salute you. I look forward to attending more of your future courses. (P/S: Notice how many times I use the word ‘inspirational’? ;)p Amituofo, P.H. Shen Shi’an (沈时安) is an independent Buddhist teacher, author, researcher, translator, editor and poet, he was one of the founding members of the Dharma Propagation Division of Kong Meng San Phor Kark See Monastery (Bright Hill Temple in Singapore) in 1997. Holding a Master of Arts degree in Buddhist Studies that covered all major Buddhist traditions, he served as a Dharma Trainer and Project Coordinator in its Community Development & Training Department until 2011, focusing on Buddhist research, writing, teaching and answering of media queries on Buddhism. He was the founder of the temple’s Youth Mission, a book purchaser for its Awareness Place project, and the Chief Editor of the Web & Library Department, that co-supported Buddhanet.net, a popular Buddhist education website. He also contributes occasionally to magazines such as ‘Nanyang Buddhist’, ‘Awaken’ (for which he was a Contributing Editor), ‘For You (Information)’ (for which he was invited to be an editorial board member), and ‘Eastern Horizon’. He served with the film selection team of a Buddhist film festival, writes movie reviews for BuddhistChannel.tv, the world’s leading Buddhist news network, and popularised Dharma@Cinema, which is an innovative way of sharing the Dharma through detailed reviews and discussions of both popular and offbeat films. Using retranslated sūtras and treatise texts, he has taught on the Pure Land teachings at Singapore Buddhist Federation, Kong Meng San, Pu Ji Si Buddhist Research Centre and Poh Ming Tse. He also leads the Pureland Practice Fellowship, which he founded in 2008. 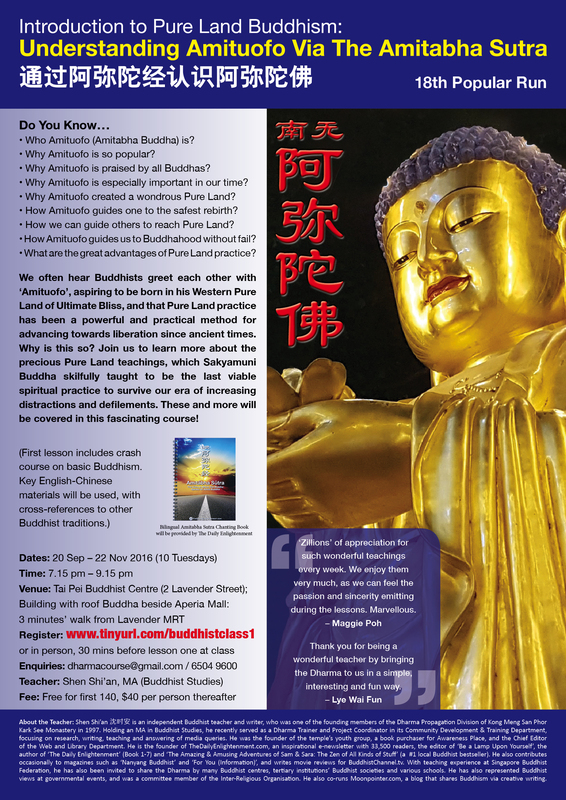 As a participant, he was also invited to be a group counsellor for the ‘Theory And Practice Of Pure Land Buddhism’ course at Singapore Buddhist Lodge, and to be its commemorative magazine’s chief editor. He is also occasionally invited to conduct Dharma discussions for youths of tertiary institutions’ Buddhist societies (NTUBS, NUSBS, SIMBB, NPBS, NYPBS) on various subjects, and to introduce Buddhist life perspectives at Secondary Schools (St. Patrick’s School, Manjusri School, and its Buddhist Interact Club), Junior Colleges (Catholic Junior College) and International Schools (UWCSEA, SJII). He was also invited to share on Buddhism by Dharma Drum Mountain (Singapore), Fo Guang Shan (Singapore), Tai Pei Buddhist Centre, Singapore Buddhist Mission Youth, Singapore Buddhist Youth Mission, Wat Ananda Youth, Buddha Of Medicine Welfare Society, The Buddhist Union Dharma Centre, Buddhist Fellowship, Dot Connections Growth Centre and Kampung Senang. He has also been invited to Indonesia (Ekayana Buddhist Centre) and Malaysia (Than Hsiang Temple) to teach. He was a committee member of the Inter-Religious Organisation, through which he served in interfaith harmony projects by writing and giving of public talks, having represented Buddhist points of view at national events held by NACLI, NHB, NHG, SAF, SPF, MHA, ACM, SPM, STB, OnePeople.sg, IRCC and MCYS. He was also chosen to be a member of the Publications Consultative Panel under Singapore’s Ministry Of Communications And Information. He also co-runs Moonpointer.com, which is a community blog that promotes creative sharing of Buddhism via thousands of articles, and Purelanders.com, which archives hundreds of articles on the Chinese Pure Land teachings in English. He is also the founder of Facebook pages such as Buddhist Vegan Fellowship, Buddhist Confessions & Resolutions and Cinema Dharma. He can be reached at tde<at>thedailyenlightenment.com for invitations to share the Dharma via articles and talks. Should An Ancestral Tablet Be Placed Here Or There?